Noise-induced hearing loss (NIHL) is one of worldwide occupational disease for chronic exposure to loud noise. However, the voxel-mirrored homotopic connectivity has not been used previously to investigate interhemispheric functional coordination in NIHL patients. This study aimed to explore the alterations of interhemispheric resting state functional connectivity in NIHL patients by using voxel-mirrored homotopic connectivity (VMHC) technique. 21 patients with MS-NIHL and 30 control subjects were underwent resting-state functional magnetic resonance imaging (fMRI). An automated VMHC approach was used to analyze and compare the VMHC correlation coefficients between the MS-NIHL and control subjects on SPM8 software package. Compared with control subjects, the MS-NIHL patients showed increase of VMHC values in the inferior frontal gyrus, anterior cingulated cortex and paracentral lobule. There was negative correlation between VMHC and occupational noise exposure duration in the precuneus and inferior frontal gyrus in the healthy controls and MS-NIHL patients. In conclusion, interhemispheric VMHC coefficients were altered in MS-NIHL patients, and it provided evidence for neural network functional and neural reorganization in sensory, attention and cognition cortices of MS-NIHL patients. Noise, Occupational medicine, Interhemispheric resting state. Noise-induced hearing loss (NIHL) is most often caused by continuous and regular exposure to excessive noise, which reduced gradually bilateral sensorineural hearing loss . NIHL is the second most important worldwide occupational hazards except for pneumoconiosis and it contributes to 16% of adult hearing loss globally, ranging from 7% to 21% in various sub-regions and more in developing countries . Workers in industries such as mining, grinding, drilling, crushing, welding, drop forging, iron and steel companies, et al, are at high environmental risk of NIHL. NIHL not only exited in industrialization developing countries such as China, Indian, Malaysia, Nepal and so on, but also in Europe, the United States and other developed countries [3-6]. Several studies indicated that prolonged exposure to noise induced hearing loss and tinnitus which might be due to alterations in the central auditory function [7,8]. With the development and application of fMRI, especially the rest-state fFMRI, more and more researches relevant to the auditory cortex function of human brain are published, which provide evidence for neuroplastic changes in the brain function in deafness patients [9-11]. Functional homotopy, the high degree of synchrony in spontaneous activity between homotopic interhemispheric counterparts, is a key characteristic of the brain's intrinsic functional architecture. Homotopic resting-state functional connectivity (RSFC), as a powerful tool may characterize intrinsically functional associations among brain regions while the synchrony of RSFC between a voxel in one hemisphere and its mirrored counterpart in the other can be revealed by voxelmirrored homotopic connectivity (VMHC). The VMHC was sensitive to abnormal homotopic RSFC that has been demonstrated in schizophrenia, Parkinson’s disease, depression, Alzheimer’s disease, etc [12-16]. However, to our knowledge, the VMHC has not been used previously to investigate interhemispheric functional coordination in NIHL patients. Our study aimed to find the alterations in information communication between bilateral cerebral hemisphere integration and to provide evidence for neural network functional plasticity in MS-NIHL patients. 21 patients with moderate and severe MS-NIHL and 30 healthy controls were recruited and participated in the study from January 2014 to September 2015. The criteria for all subjects were as follows: Han Chinese, male, right-handed, no inner ear disease, no history of craniocerebral surgery and other disorders, no history of taking potentially neurotoxicity of drugs, and no abnormal findings in routine MRI of brain. All the controls were matched for age and education to patients with MS-NIHL. All subjects gave written informed consent prior to participation. The study was approved by the local Medical Research Ethics Committee. The MS-NIHL patients were clinical diagnosed by the specialists of occupational disease and met the criteria from Diagnostic Criteria of Occupational NIHL (GBZ 49-2014). The criteria for patients with MS-NIHL were as follows: firstly, patients had history of exposure to noise more than 85 dB and prolonged 3 years for a nominal 8-hour working day; second, the binaural hearing thresholds were all over 40 dB at high (3000, 4000, 6000 Hz) and speech (500, 1000, 2000 Hz) frequencies. Also, rule out other causes of hearing loss. Correspondingly, normal hearing meant that the binaural hearing 75 thresholds were all less than 25 dB at high and speech frequencies were obtained from the results of pure-tone audiometry. MRI data acquisition were performed on 3.0T Discovery MR 750 system (General Electric Medical, USA), with 8 channel phased array coil. Foam padding and earplugs were used to limit head motion and reduce scanner noise. All Subjects were instructed to lie quietly with their eyes closed and no thinking in particular during resting state fMRI data acquisition. The MRI protocol included T1WI, T2WI, T2-FLAIR, DWI, threedimensional fast spoiled gradient recalled (3D-FSPGR) and BOLD sequences. The BOLD images were obtained using a gradient-echo-planar imaging sequence (repetition time (TR)=2000 ms; echo time (TE)=35 ms; slices=40; field of view (FOV)=240 mm × 240 mm; slice thickness=4.0 mm; inter-slice spacing=0 mm; acquisition matrix=64 × 64 and flip angle (FA)=90°, scan time=6 minutes and 40 seconds). Structural images were acquired with a sagittal 3D T1-weighted FSPGR in the following parameters: TR=6.9 ms, TE=3.4 ms, 176 sagittal slices, slice thickness=1.0 mm, inter-slice spacing=0 mm, acquisition matrix=256 × 256, FA=12° and scan time=4 minutes and 33 seconds. The resting state functional data were processed using Data Processing Assistant for Resting-State fMRI (DPARSF)  based on SPM8 software package (http://www.fil.ion.ucl.ac.uk/spm/) and REST (http://restfmri.net/forum/rest). Briefly, the preprocessing steps were as follows: removal of first 10 time points, slice timing correction, realign(Participants were examined with no more than 1.5 mm maximum displacement in x, y, or z and 1.5° of angular motion. ), spatial normalization to the Montreal Neurological Institute (MNI) template in the SPM8 (voxel size: 3 × 3 × 3 mm3), spatial smoothing utilizing an isotropic Gaussian kernel(6mm full width at half maximum (FWHM)), temporally bandpass filtering (pass band 0.01-0.08 Hz) and linearly detrended removal. VMHC assumes symmetric morphology between hemispheres. The VMHC analyses were processed using REST software. For each participant, the homotopic RSFC was computed as the Pearson's correlation coefficient between the time series data of any pair of symmetrical voxels. Correlation values were then Fisher z-transformed to improve the normality. The resultant values were referred to generate the VMHC maps. Two-sample t-test was performed to assess the differences in age and education years (statistical significance was set at P<0.05) between MS-NIHL patients and controls. Individual VMHC maps were used for a voxelwise two-sample t-test analysis between MS-NIHL group and control group with the REST analysis toolkit. The result was corrected with AlphaSim program. To investigate the relationships between the VMHC and noise exposure duration, Pearson correlation analysis was performed in a voxelwise manner using REST software (The significance level was defined as P<0.05, two-tailed). All 30 healthy controls and 21 MS-NIHL patients eligibly were incorporated, aged from 35-60 years old. The mean age of healthy controls was 46.8, while MS-NIHL is 45.6. The mean education levels of healthy controls and MS-NIHL were 10.3 and 10.0 respectively. The patients’ exposure noise duration was 21.3 years. The characteristics of the NIHL patients and healthy controls are summarized in Table 1. There was no significant difference between control group and NIHL group in age and education level. Table1. Characteristics of the MS-NIHL patients and healthy controls. Compared with control subjects, the MS-NIHL patients showed increases of VMHC values in the inferior frontal gyrus, anterior cingulated cortex and paracentral lobule. The brain functional regions involved in Brodmann 44/45 (Broca's area), 3/5 somatosensory area and 24 cognition area (Figure 1 and Table 2). 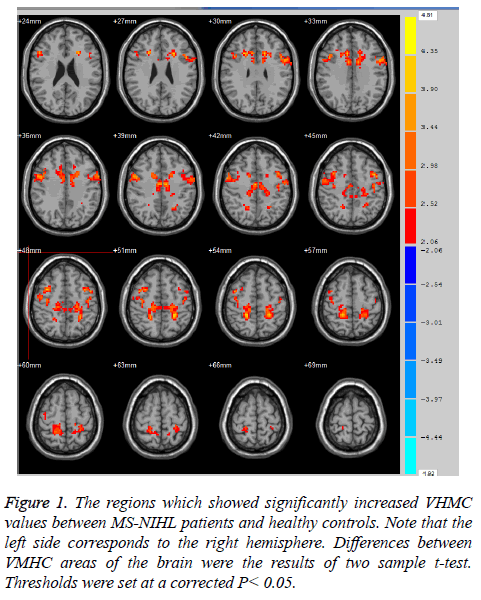 Colour regions in Figure 1 indicated that VMHC values significantly increased between MS-NIHL patients and healthy controls. Differences between VMHC areas of the brain were the results of two sample t-test. Thresholds were set at a corrected P<0.05. Besides, there was negative correlation between VMHC and occupational noise exposure duration in the precuneus and inferior frontal gyrus between the healthy controls and MS-NIHL patients. The brain functional regions involved Brodmann 6/9 and 7/31 areas (Table 3). Figure 1: The regions which showed significantly increased VHMC values between MS-NIHL patients and healthy controls. Note that the left side corresponds to the right hemisphere. Differences between VMHC areas of the brain were the results of two sample t-test. Thresholds were set at a corrected P< 0.05. Table 2. Significant differences regions in VMHC between MS-NIHL patients. Table 3. Correlations regions between VMHC and noise exposure duration. Hearing is an important medium to obtain external information for human. However, a lot of noise exists in the daily life and production environment. In particular, some special occupational groups have long suffered from high intensity noise, resulting in a decline or loss of hearing [3-6]. Hearing is an important function of the human brain, so brain auditory cortex function has been a very important research content content. In this study, voxel-mirrored homotopic connectivity (VMHC), a novel method was used for evaluating on restingstate fMRI. Recently, some studies found that there is a weak electrical activity when the brain is in a state of quiet without performing any task [18,19]. The weak electrical activity can be detected by functional magnetic resonance imaging, so it has aroused great interest of researchers. Vorel et al. proposed that human brain has the default network connection in the quiet state without any stimulation. Also, it is wellknown that there were connection and asymmetry between brain hemispheres [20-22]. In our study, the VMHC method was used to compare interhemispheric RSFC changes between patients with moderate and severe NHL and control subjects. To our knowledge, there is no report in using VMHC to identify changes in interhemispheric functional connectivity of NIHL. No significant decreases in VMHC were observed in the MSNIHL patients compared to controls. They are part of the consistent with Yu-Chen chen’s results, which showed increases in the middle temporal gyrus, middle frontal gyrus and superior occipital gyrus in the tinnitus patients . There is a complicated relationship between tinnitus and hearing loss, some research results suggested that chronic tinnitus rather than hearing loss was responsible for the increased connectivity with some brain regions especially attention processing node . MS-NIHL patients showed increases in VMHC in the inferior frontal gyrus, anterior cingulated cortex and paracentral lobule. Our data hold no brief for Husain’s voxel-based morphometry (VBM) analysis data, which individuals with hearing loss without tinnitus had gray matter decreases in anterior cingulated and superior and medial frontal gyri as well as region-of-interest relvealed additional decreased in superior temporal gurus relative to those with hearing loss and tinnitus .They observed that hearing loss rather than tinnitus had the greatest influence on gray and white matter alterations. We need additional studies to make the correlation clear between the VBM and VMHC. Similar to Hwang’s results . our data showed connection decreases of Broca’s (BA44/45), somatosensory (BA5) and cognition (BA24) regions in MS-NIHL patients, which suggest peripheral hearing loss can result in plastic changes in the connection of both hemisphere in the central system widely. Increased VMHC values may represent a compensatory mechanism secondary to these difficulties induced by hearing loss like as increased ALFF by Yang Ming’s . Some studies found that the default mode network (DMN) and limbic system and the dorsal attention network may be susceptible to chronic auditory deprivation [23,26,27], and the prcuneus is important part of these structures. Compared the correlation of VMHC and noise exposure duration between the healthy controls and MS-NIHL patients, a negative correlation was found in the precuneus and inferior frontal gyrus, that does not support our thought and Yu-Chen chen’s results . This may be because older age always accompanies with longer exposure duration, and we need a larger population to study the reason. This study has several limitations. First, considering the crosssectional nature of our experimental design and limited sample size, further studies are needed with a larger population of subjects. Also, NIHL patients have an increased risk of vibration white finger , that maybe cause some effect to the brain activity, but guess these alterations mainly in motor corti. Furthermore, a technological issue is the possible confounding effect of MR scanner noise to affect brain activity and intrinsic brain networks [29,30]; however, this confound should affect our controls and NIHL patients to a similar degree. Finally, to study the cerebral regional anatomy morphometry, white matter integrity and micro hemodynamic in NIHL, we need further studies by using VBM, Diffusion Tensor Imading (DTI) and Arterial Spin Labeling (ASL) method. Our results showed, with the aggravation of hearing loss in MS-NIHL patients, the interhemispheric resting-state FC of VMHC is increased in the sensory, attention and cognition cortices, which may be implicated in the neuropathophysiology in NIHL. VMHC analysis might provide a novel approach to evaluating abnormal functional connection in brain regions and provide insights into the neural network functional reorganization in NIHL patients, it will play an important role for NIHL prevention and curative effect evaluation. The department of Medical Imaging of Jinan Military General Hospital in Shandong province of China provided assistance with the data analysis. Hu F, Li X, Wang M. Lack of association between DNMT1 gene polymorphisms and noise-induced hearing loss in a Chinese population. Noise Health 2013; 15: 231-236. Nelson DI, Nelson RY, Concha-Barrientos M, Fingerhut M. The global burden of occupational noise-induced hearing loss. Am J Ind Med 2005; 48: 446-458. Singh LP, Bhardwai A, Deepak KK. Occupational noise-induced hearing loss in Indian steel industry workers: an exploratory study. Hum Factors 2013; 55: 411-424. Whittaker JD, Robinson T, Acharya A. Noise-induced hearing loss in small-scale metal industry in Nepal. J LarynqolOtol 2014; 128: 871-880. Lie A, Skoqstad M, Johannessen HA. Occupational noise exposure and hearing: a systematic review. Int Arch Occup Environ Health 2016; 89: 351-372. McBride DI. Noise-induced hearing loss and hearing conservation in mining. Occup Med (Lond) 2004; 54: 290-296. Sliwinska-Kowalska M, Davis A. Noise-induced hearing loss. Noise Health 2012; 14: 274-280. Henderson D, Bielefeld EC, Lobarinas E, Tanaka C. Noise-induced hearing loss: Implication for tinnitus. In: Møller AR, editors. Textbook of Tinnitus. Berlin: Springer Science + Business Media, LLC; 2011. Ulualp SO, Biswal BB, Yetkin FZ, Kidder TM. Assessment of auditory cortex activation with functional magnetic resonance imaging. Otolaryngol Head Neck Surg 2000; 122: 241-245. Menéndez-Colino LM, Falcón C, Traserra J. Activation patterns of the primary auditory cortex in normal-hearing subjects: a functional magnetic resonance imaging study. ActaOtolaryngol 2007; 127: 1283-1291. Husain FT, Schmidt SA. Using resting state functional connectivity to unravel networks of tinnitus. Hear Res 2014; 307: 153-162. Hoptman MJ, Zuo XN, D’Angelo D. Decreased interhemispheric coordination in schizophrenia: a resting state fMRI study. Schizophr Res 2012; 141: 1-7. Hu XF, Zhang J, Jiang X, Zhou C. Decreased interhemispheric functional connectivity in subtypes of Parkinson’s disease. J Neurol 2015; 262: 760-767. Guo W, Liu F, Xue Z. Decreased interhemispheric coordination in treatment-resistant depression: a resting-state fMRI study. PLoS One 2013; 8: e71368. Wang Z, Wang J, Zhang H. Interhemispheric Functional and Structural Disconnection in Alzheimer's Disease: A Combined Resting-StatefMRI and DTI Study. PLoS One 2015; 10: e0126310. Wang Y, Yin Y, Sun YW. Decreased prefrontal lobe interhemispheric functional connectivity in adolescents with internet gaming disorder: a primary study using resting-state FMRI. PLoS One 2015; 10: e0118733. Chao-Gan Y and Yu-Feng Z. DPARSF: a MATLAB toolbox for “pipeline” data analysis of Resting-State fMRI. Front SystNeurosci 2010; 4: 13. Vorel SR, Liu X, Hayes RJ, Spector JA, Gardner EL. Relapse to cocaine-seeking after hippocampal theta burst stimulation. Science 2001; 292: 1175-1178. Chen YC, Xia W, Feng Y. Altered interhemispheric functional coordination in chronic tinnitus patients. Biomed Res Int 2015; 2015: 345647. Geven LI, de Kleine E, Willemsen AT, van Dijk P. asymmetry in primary auditory cortex activity in tinnitus patients and controls. Neuroscience 2014; 256: 117-125. Bilecen D, Seifritz E, Radü EW. Cortical reorganization after acute unilateral hearing loss traced by fMRI. Neurology 2000; 54: 765-767. Schmidt SA, Akrofi K, Carpenter-Thompson JR, Husain FT. Default mode, dorsal attention and auditory resting state networks exhibit differential functional connectivity in tinnitus and hearing loss. PLoS One 2013; 8: e76488. Husain FT, Medina RE, Davis CW. Neuroanatomical changes due to hearing loss and chronic tinnitus: a combined VBM and DTI study. Brain Res 2011; 1369: 74-88. Hwang JH, Wu CW, Chou PH, Liu TC, Chen JH. Hemispheric difference in activation patterns of human auditory-associated cortex: an FMRI study. ORL J OtorhinolaryngolRelat Spec 2005; 67: 242-246. Yang M, Chen HJ, Liu B. Brain structural and functional alterations in patients with unilateral hearing loss. Hear Res 2014; 316: 37-43. Lanting CP, de Kleine E, van Dijk P. Neural activity underlying tinnitus generation: results from PET and fMRI. Hear Res 2009; 255: 1-13. Turcot A, Girard SA, Courteau M, Baril J, LarocqueR.Noise-induced hearing loss and combined noise and vibration exposure. Occup Med (Lond) 2015; 65: 238-244. Scarff CJ, Dort JC, Eggermont JJ, Goodyear BG.The effect of MR scanner noise on auditory cortex activity using fMRI. Hum Brain Mapp 2004; 22: 341-349. Yetkin FZ, Roland PS, Purdy PD, Christensen WF. Evaluation of auditory cortex activation by using silent FMRI. Am J Otolaryngol 2003;24: 281-289.